Create your Dragon1 User Page. Fill it with visionairy sketches for agile enterprises, share digital content, show your expertise with your network and build up your personal online brand. Dragon1 as a whole is 1) a digital platform to co-create and manage enterprise architecture, 2) a set of resources including an open method for enterprise architecture, and 3) a community consisting of professionals, experts and job seekers that share visions and knowledge via digital models. Dragon1 CONNECT is the subscription that enables you to create a Dragon1 user page and makes you a member of the community and gives you access to the core applications of the platform. 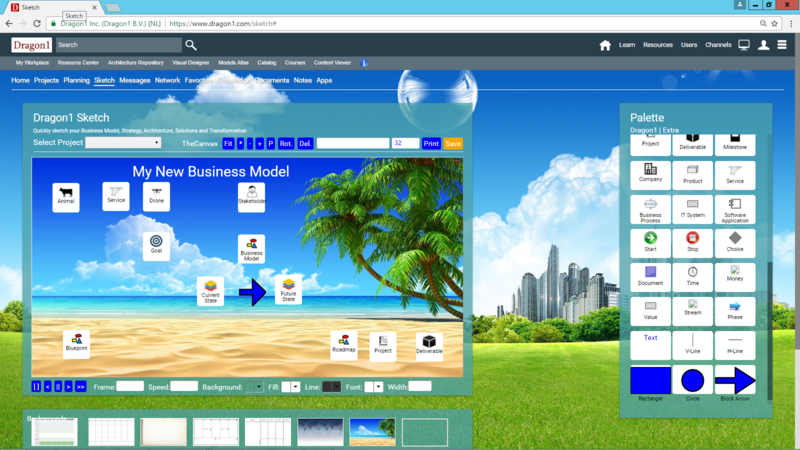 Dragon1 CONNECT supports you in uploading and sharing models on your page, creating sketches and doing project management. You can also create an online profile and portfolio on your page, write blogs and extend your professional network. Create your own identity, profile and channel. And claim your handle and channel urls. 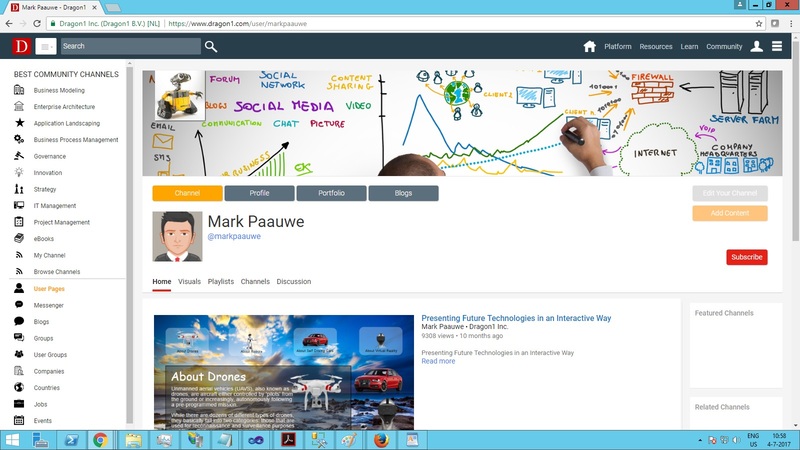 Screenshot of a user channel. You see the avatar and handle, personal styling and a published visual content item. On the Dragon1 Platform you build your personal brand. You create visual content and publish it in your channel. Next you start to invite other professionals to comment your content and startup discussions with them. To be able to do this you get your own user channel page with a search engine friendly url. And you get a personal handle. You create follow-lists of people and content of others. With all these ingredients you build your personal brand online. Anyone can create an account on Dragon1 and you are free to choose your username, handle and channel names. You can create and claim as many channel urls as you like. *Dragon1 PRO users can also create and claim a company page URL. Dragon1 CONNECT is the perfect tool for any business professional or consultant. Dragon1 CONNECT is a networking tool to find connections to recommended job candidates, industry experts and business partners. You can manage lists of contacts and their details and participate in discussions. Here you see a screenshot of the Networking Module. Here you can find and create lists or groups of connections and network. In the messaging module, you can have 1-on-1 interaction with your network contact. You also have a Sketch module with basic features for strategy, process and architecture modeling. With these tools, you can create any diagram, presentation or visualization you need for your projects and portfolio. On Dragon1 CONNECT you Build-up an online presence with your profile, portfolio and you do updates to attract projects or find a new job. If you use all the features on Dragon1, you will stand out from the crowd as an expert and connect with people you trust! 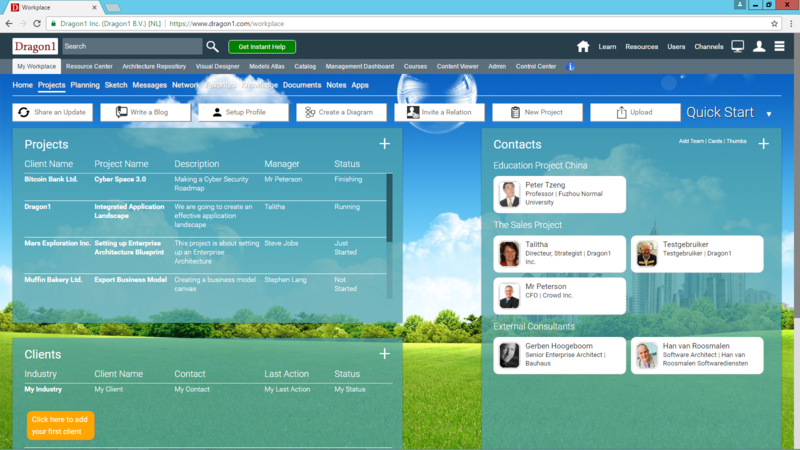 If you are a business professional or consultant, you can organize your work completely on Dragon1. Here you see a screenshot (above) of the Project Module. You can administer and manage contacts and their details. You have a lot of features for tagging, grouping and searching your contacts. If you do projects at clients you can also administer and manage it. If you are a business professional, consultant or student, you have come to the right place! 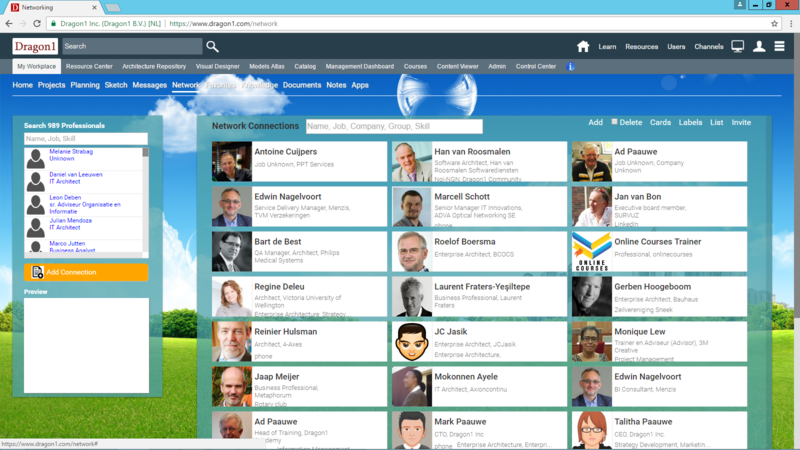 Dragon1 CONNECT is the networking version of Dragon1, the digital platform for enterprise architecture. As user will learn here to create valuable models, views, diagrams, presentations and other types of visualizations for business purposes. Dragon1 has a repository and web applications. All of your work is stored for later reuse and you can collaborate with other users. Take a look at the Examples and the content in the Content Viewer to see what you can be creating with Dragon1. Dragon1 unlocks your talents, the potential of the internet and the repository based web applications. This combined leads to important business benefits and outcomes like: increase in productivity, reuse, sustainability, risk control and joy. Dragon1 above all makes your work more fun! Sharing updates is a popular features on many platforms, so also on Dragon1 you can keep your co-workers in the loop with Dragon1 Feed. You can stand out from the crowd on Dragon1: build up an online presence with a portfolio and profile. In watch pages you can spread knowledge about new concepts with Dragon1, like Robotization. Teach yourself or educate other people in new concepts like Smart Cities. 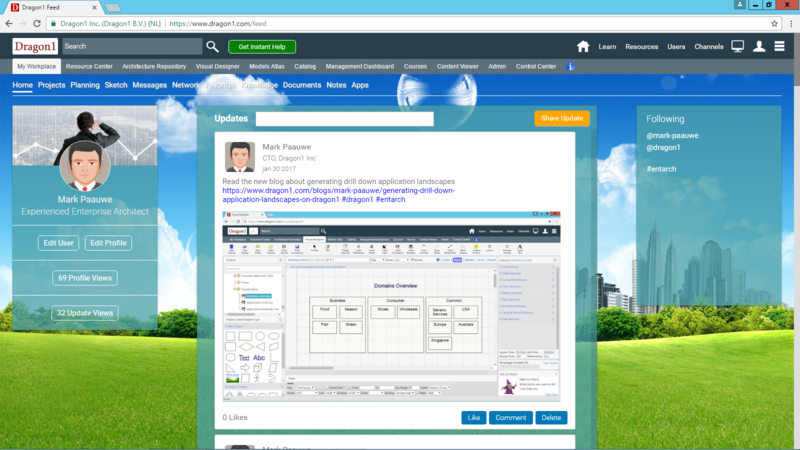 You can use Dragon1 for instance internally in business / IT projects and externally for marketing communication. Organizing your work: Project Management, Task Manager, Clients Manager and Contract Manager. Profiler and Blogger Create and manage your user profile, make it public (findable in search engines) or private and create and publish blogs. ePortfolio Create and Manage your online CV with created content on Dragon1. Dragon1 provides you with guidance exercises, tutorials and videos on creating visualizations, models, presentations and diagrams. Also, you can create your own step-by-step guides and exercises for your own content, making it the perfect online eLearning software tool or solution for everyone. Every tutorial or task list makes use of the percentage-completed bar and for every tutorial or task list, session statistics are kept. This provides you as a user with feedback on how well you do your exercises. You can purchase your user license here online at any time. And right away you can login and start using Dragon1. Technical service desk - If you run into an issue or bug in using Dragon1 we will respond compliant to the bronze service level. Every user on Dragon1 gets his own separate database instance. Data is back-upped daily automatically. Please Note: We do not share the data in your account with any other organization or provide access to it. We do not try to make money with your data or analyze it to discover trends and target you with advertising. If we are notified on copyright infringements, we take that very seriously and we will act accordingly. Using Dragon1 means you comply with all of our terms. Why a CONNECT Edition of Dragon1? The Dragon1 CONNECT edition fulfills the need of users to have only access to the core features of Dragon1 and its repository, whereas the Dragon1 PRO and Dragon1 ENTERPRISE edition provide you with access to advanced and expert features. The main difference between the CONNECT and PRO or ENTERPRISE editions is that CONNECT focusses on sharing models and building up a personal online brand. PRO and ENTERPRISE focus on strategic planning, enterprise architecture visualization and monitoring transformation. The PRO and ENTERPRISE edition gives you full access to the web applications Architecture Repository, Catalog, Report Manager, Recourse Center, Models Atlas and Management Dashboard. Read more about the differences between the editions of Dragon1 here.